Summer is almost over but I wanted to share with you this adorable idea I came up with for your backyard entertaining! I know when I was raising my boys, when we weren’t camping, my backyard was filled with neighborhood kids swimming. Barbecues played a big part in feeding the masses…haha. I even remember the watermelon ‘food fights’. Ah, wonderful memories. I want to share a cute idea I had to make add to your picnic or entertaining table. This is an easy, and inexpensive craft, and you can make it in minutes with just a few materials. This is what I started out with…a little terra cotta pot. Tip: If you are using a used pot, you need to clean with bleach and water, rinse, and let sit in the sun to completely dry through the pot. Now if you follow my blog, you know before I add a bright color, that I sprayed with White first. This is to make the final color, red, POP ! After that I covered the rim and painted the rest red…..after the red dried, I painted the rim green with acrylic paint. I then took a black permanent marker and made little seeds. When it was dry, I painted lightly over the seeds with red acrylic paint. I know, your thinking I’m going in circles…could be….I create as I go. I just wanted to give it more depth and ” looks like there are seeds just under where we can barely see it”. Like shadows. I painted the inside red as seen above, Gave it a coat of Clear Coat Spray. 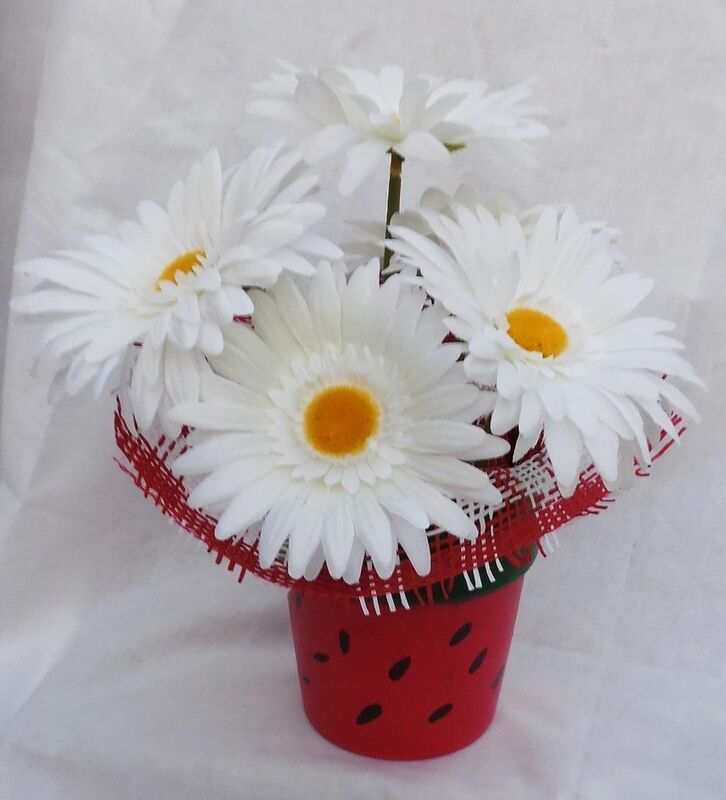 I’ve had this red n white checkerboard pattern, it looks like summer picnics and barbecues……and I love daisies! So what do you think? Wouldn’t this look adorable on your summer table? Absolutely adorable container! I love how creative you are! Robin, you are too sweet. I am borrowing one of your articles…hope it is okay! Everyone loved your posts! Me included! Thank you so much kristian!! I am saving this idea for Teacher appreciation week when all the kids bring in flowers and plants for the teachers. This would so cute! Oh that’s such an adorable idea!!! Please send me a pic!! Thank you! I love Thursdays craft days with neighborhood children! I love watching their busy little hands!